All this “hybrid” equipment (DPH) allows the Hopper/Joey/Super Joey to network with less wiring and less equipment. Note that DPH equipment only works with the Hopper/Joey/Super Joey, not VIP receivers (211, 622, 722, and so on). So if you’re an RVer with a Hopper system, the new DPH equipment is worth a look see. NOTE 1: (2/15/2016) This upgrade has been tested with a Hopper with Sling (“Hopper 2”) and a Hopper 3. A Hopper 3 will work with a DPH upgraded Winegard Travler. However, the Hopper 3 must be disconnected from the Winegard Travler during satellite acquisition. NOTE 2: Performing this upgrade would probably void any warranty on your SK-1000. Do this upgrade at your own risk — what worked for me may not work for you. NOTE 3: If you use a 1000.2 tripod dish, you should also upgrade this to DPH. 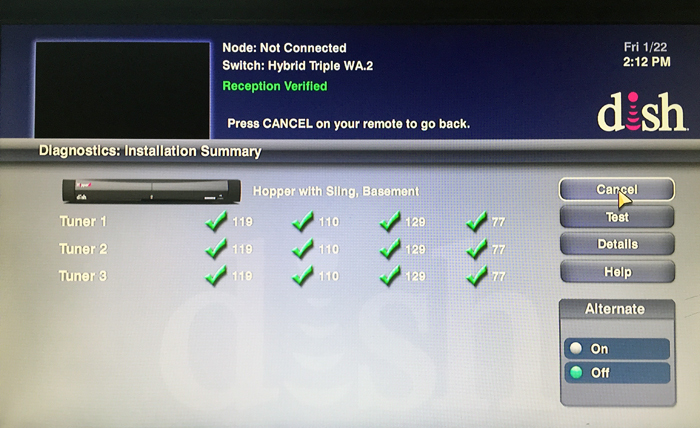 Only the 1000.2 dish, not a 1000.4, can be upgraded to DPH. Raise the Winegard Travler SK-1000 using the SK-1000 Controller Box. After the SK-1000 has finished acquiring satellites, remove power from the SK-1000 Controller Box. Disconnect coax cables from the “A”, “B”, and “C” ports located on the base of the Winegard Travler SK-1000. Do NOT disconnect the Controller Box cable. Remove all four bolts on the LNB Guard using a 3/8-inch socket wrench. Slide the LNB Guard down the LNB arm. Remove the plastic LNB Holder. On the DISH Pro Plus (DPP) LNB, number each LNB output (1, 2, and 3) and number each coax cable. Then remove each coax cable and put the DPP LNB aside. Use a continuity meter on each number coax cable to determine which cable corresponds to which lettered output (A, B, C) on the base of the SK-1000. I used a Super Buddy meter to test A, B, and C. Regardless, you need to find out which of the lettered ports is inactive. Also, you need to identify the Port 1 DPH connection because this port must be connected to the Hybrid Solo Hub. 1/24/2016 WING DISH UPDATE:When I tried adding a wing dish to my DPH modified Travler, it did not work properly.Though my Hopper with Sling did “see” the extra wing dish satellite (77°) . . . I verified these readings at the Winegard Travler base with my Supper Buddy meter. However, after I disconnected the wing dish coax from the Travler’s DPH LNBF, the signal strength for sats 110°, 119°, and 129° returned to normal. Tape the metal end of numbered coax cable 3. Reattach the plastic LNB Holder to the DPH LNB. Connect a Hybrid Solo Hub to Port 1 of the SK-1000 DPH LNBF. NOTE: Only one Hopper 3 is allowed per dish. REMEMBER: From step #9, one of the ports (A, B, or C) will NOT be connected to the DPH LNB. An unconnected port cannot be used. Apply power to the SK-1000 Controller Box. Disconnect the Hopper 3 from the Winegard Travler. Raise the SK-1000 and let it finish acquiring satellites. Then reconnect the Hopper 3 to the Winegard Travler. 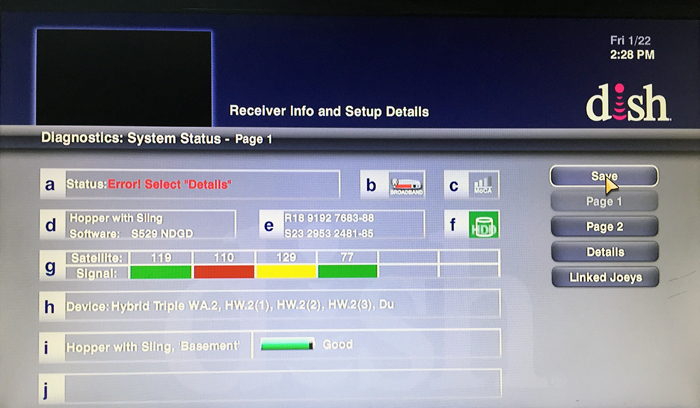 After completing my DPP to DPH swap, I used a Super Buddy meter to test each satellite ID (and signal strength) from my upgraded Travler. I think the DPH upgrade passed the test. NOTE: Sat 61 was also acquired in Manual Mode. However, its LOCK and Signal Strength is not shown. Take my word — it worked as well.